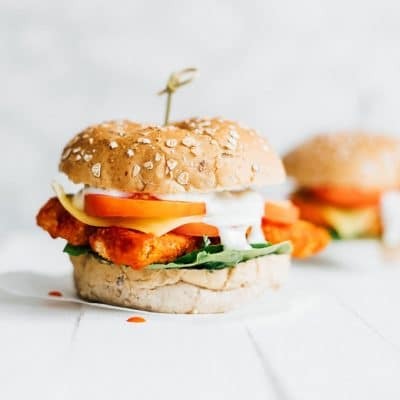 These Buffalo Tempeh Sandwiches are stuffed with crispy baked tempeh buffalo tenders, provolone cheese, and ranch dressing! My go-to vegetarian meal maker is almost always chickpeas, followed closely by tofu and mushrooms. But for when I’m craving something a little different (or for when the tulip-man noticeably feigns excitement over yet *another* chickpea recipe), we tempeh. But the thing with tempeh is, you have to do something with it. Like chickpeas plain, fine, throw them on a salad, it’s okay. But with tempeh that just won’t work. Tempeh requires a little coaxing to come out of its shell. But when it does, it’s a game changer. Case in point, these Buffalo Tempeh Sandwiches. Crispy (from baking) and packed with buffalo sauce flavor, it’s the epitome of healthy(ish) comfort food. 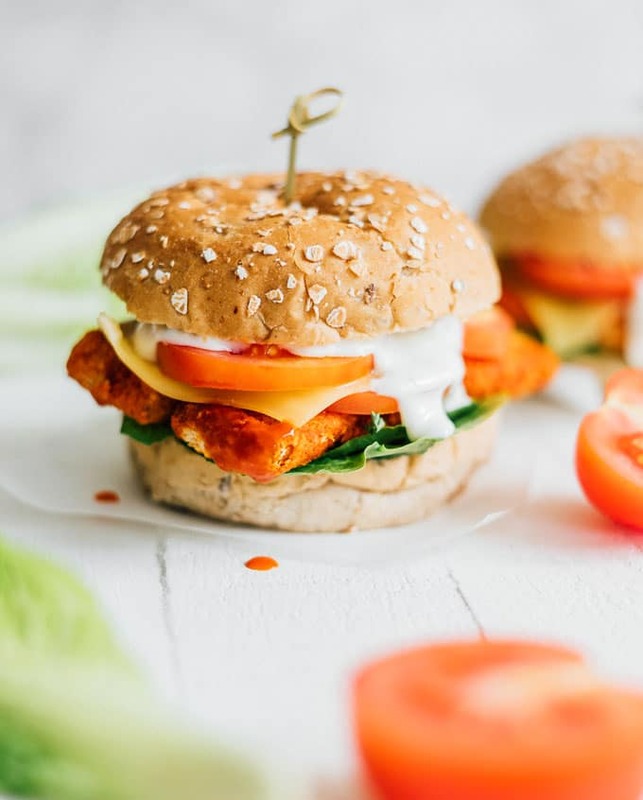 Buffalo Tempeh Tenders: Transfer tempeh into a crispy, buffalo packed tender, then plop it on a sandwich like the stuff of vegetarian bar food dreams. Get the recipe here (30 minutes to make). Provolone Cheese: Any mild cheese will do, but melted provolone really brings the ensemble together. Your favorite veggies: Crunchy romaine, tomatoes, watercress, cucumber…anything goes! 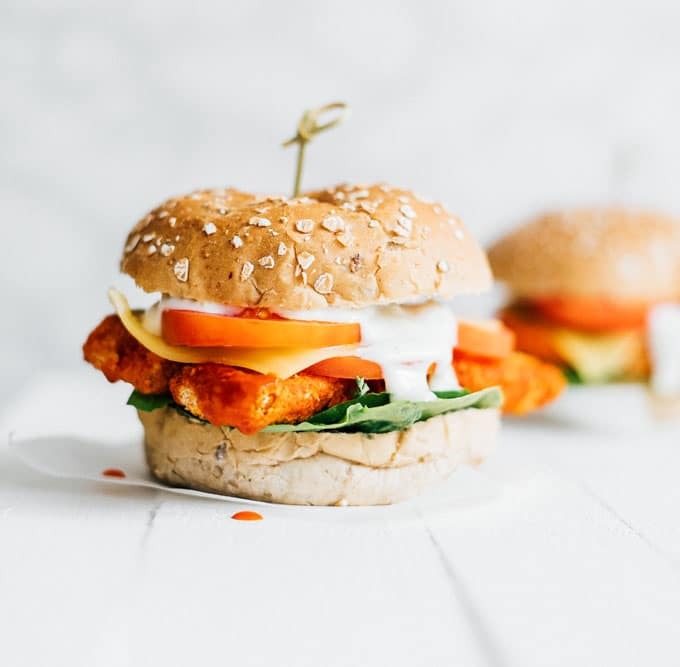 These Buffalo Tempeh Sandwiches are stuffed with crispy baked tempeh buffalo tenders, provolone cheese, and ranch dressing. 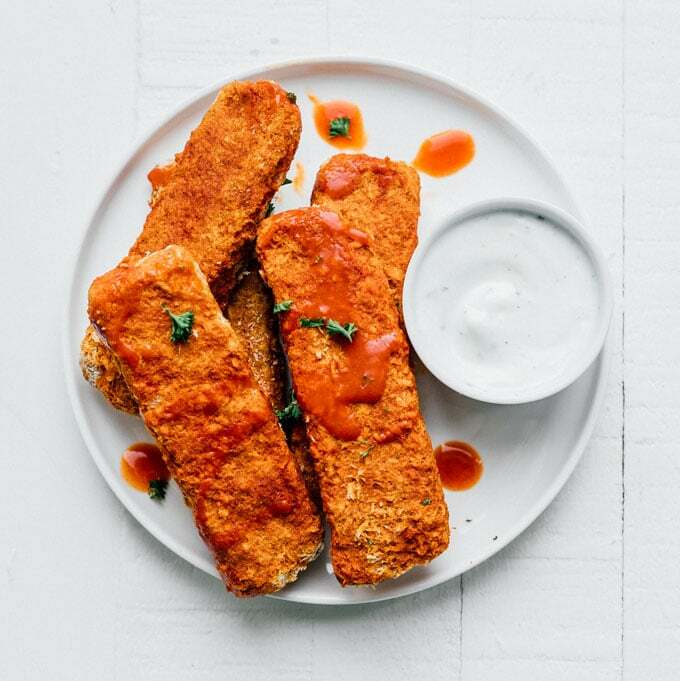 Tenders: Prepare the Buffalo Tempeh Tenders (15 minutes hands-on work, 15 minutes baking). Sandwich: While tenders bake, prepare remaining ingredients. When tenders are hot from the oven, place 2 or 3 tenders on each roll, immediately topping with cheese so it melts. Assemble with desired veggies, drizzle with sauce, and serve. Thanks so much for dropping by and for making fun recipes like these vegetarian Buffalo Tempeh Sandwiches possible!